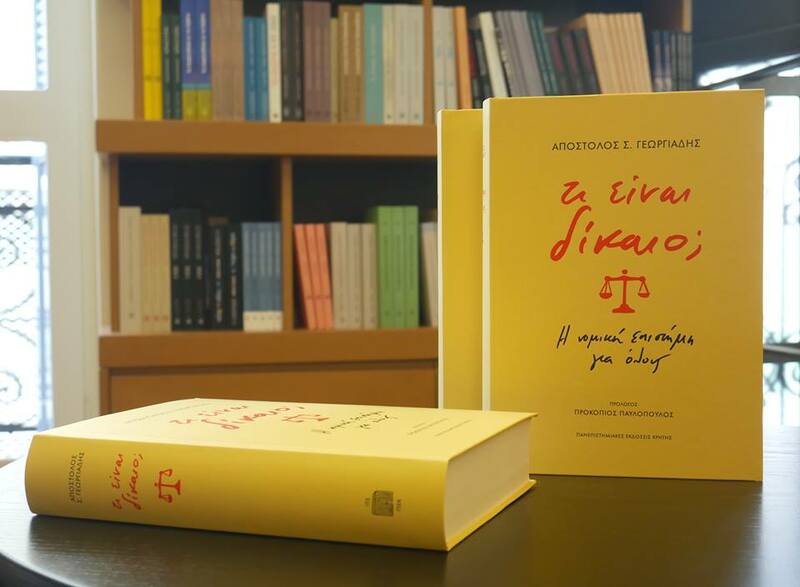 An innovative book by Apostolos Georgiades has just been released under the name “What is Law? – Jurisprudence for dummies”. This is the first attempt ever in Greece to make the legal science accessible to laymen. After many decades of authoring textbooks, Professor Georgiades now turns to non-lawyers and tries to explain in simple words how the law works. The book includes a foreword by H.E. Prokopios Pavlopoulos, President of the Hellenic Republic. The question “What is Law? “, contained in the title of the book, is very old. It concerns the theoreticians and the philosophers of Law from antiquity to the present day. We could say that this question is analogous to the one that Pontius Pilate addressed to Jesus Christ in the Praetorium: “What is Truth?”. However, this book does not seek to continue the pursuit of a response which may not exist. The purpose of the writer here is much simpler: It consists of the effort to bring Law and legal science closer to the simple citizen; to take the law down from the level of theory and place it in everyday life reality; to make clear to the non-specialist what the rules of Law mean and how they are applied everyday to a multitude of issues (commercial, financial, family, inheritance etc. ), which are created by people’s cohabitation in one community. Although law is directly and inseparably linked to people’s everyday life, it does not attract their interest and confidence to the same degree as other social and political sciences such as history, sociology, philology, history of art, etc. With the ambition to reverse this impression, the writer tries, as simply as he can and with the use of many examples, to open to the non-legal a window to the “paradise” of legal concepts; to explain the operation of many institutions; to simplify as far as possible legal constructions that seem inaccessible; and to clarify that the legislator may sometimes (or periods) exaggerate the production of laws (hence our well-known multiplicity), but, usually, is not arbitrary! Behind every legislation, hides the effort to solve problems of everyday life and to settle conflicting interests of the members of society. Apostolos S. Georgiades has been Teacher to many generations of Greek lawyers. He is an honorary and eminent professor at the Law School of the University of Athens, as well as a regular member of the Academy of Athens. He authored many legal works and has recently released his work “Searching for Law” (Sakkoulas 2017).